Pencak Silat Tedjokusuman movement (Gerak Pencak) which is conserved by the Pencak Silat Krisnamurti Mataram Organization and several other in connection organizations, is one of few Pencak Silat style that is born and grown in nDalem Tedjokusuman (one of the House of Royalty) in Yogyakarta. 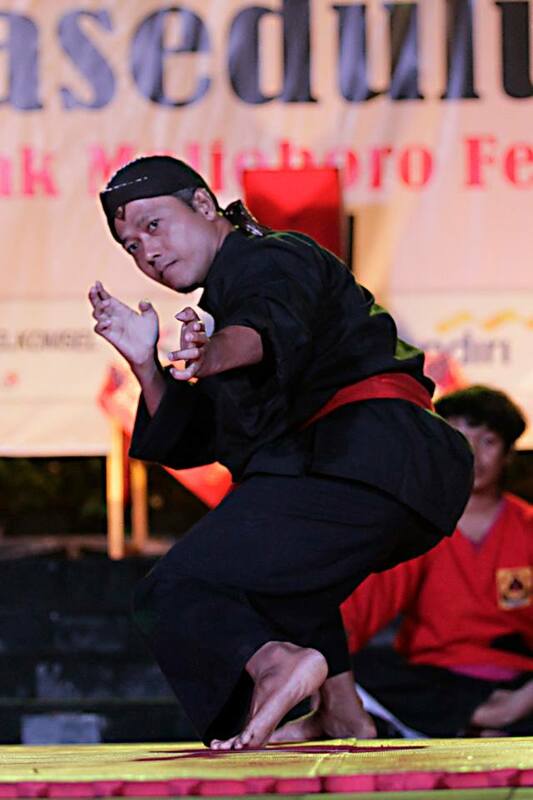 Gerak Pencak Silat Tedjokusuman will be one of the highlights in Wisata Pencak Nusantara 2015 and will be introduced and guided by one of it’s most notable Guru (instructor) Antok Sugiarto. 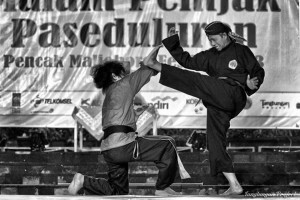 The Pencak Silat Krisnamurti Mataram Organization (Krisnamurti in short) which is located in Yogyakarta, is one of the heir of the “gaya Tedjokusuman” (Tedjokusuman style) silat created by RM. HARIMURTI. He is a prince from Kraton Ngayogyakarto (the Yogyakarta Sultanate) son of Gusti Pangeran Haryo Tedjokusumo. The International community acknowledges GPH Tedjokusumo as a Tummengung (government official) of Kraton Yogyakarta, who is known as an empu (master) of classic Yogyakarta style dance arts. An International Encyclopedia even mentioned that Tedjokusuman is the the outlet of Kraton classic dance of Yogyakarta and GPH Tedjokusuma is one of it’s empu. Raden Mas Harimurti or which is called Ndara Hari is one of the respected figures in Kraton Yogyakarta’s classic dance, silat, and kebatinan from Yogyakarta. He studied all his arts since early in his childhood. RM Harimurti was born on Selasa Kliwon, 25 Jumadilakir 1837 Jimawal or August 6th 1907 and passed away on Rebo Pon, 19 Bakdamulud 1894 Je or September 18th 1962. Since he was 13, he travelled across Nusantara (Indonesia) to learn more on silat and kanuragan (empowerment). In his travels Ndara Hari became good friends and shared knowledges with many important silat figures at the time such as Kyai Busro, Kyai Mustapa, Kyai Iskak, Kyai Iskandar, etc. Since he was young, Ndara Hari is known to be a naughty but courageous kid, he even got dropped out from Euroosche Legere School Yogyakarta for convincing his friends to not attend the coronation of Queen Wilhelmina. One proof of his courage, is his participation in “Sambuk” a competition for pendekar silat (silat warriors), in a closed space in the form of a kalangan (cage) using their own weapon of choice. From nine Sambuks he participated in, Ndara Hari never lost a single fight. This is what prompts his appointment as judgje of Sambuk 3 times in a row. Ndara Hari also studies foreign martial arts such as Jiu-Jitsu which he learnt specifically by calling an instructor from Japan which is very costly. Ndara Hari also learnt Chinese Kung Fu from the Sam Ban Ning and Shantung style and at the time was acknowledged as a warrior followed by a ceremony. In 1930, Ndara Hari made a commotion in Dalem Tedjokusuman by summoning a panther. This Panther was shot dead by the Dutch police in the end. What he did proved that he has the ability to control living beings. At the time of the Japanese occupation in Indonesia Ndara Hari was challenged into a fight by an executor from the Japanese army. The Japanese Judo and Karate master was defeated by being put to sleep in under five minutes. In his lifetime Ndara Hari is known as a warrior that has mastered pencak silat and also able to use magical powers. One of Ndara Hari’s legacy that is inherited and taught to people that studied under him is the martial arts style which is later known as Gerak Pencak Aliran Tedjokusuman. During his time as a Guru he has many student that studied Seni Pencak Silat (Martial Arts) that Ndara Hari created, some of those students preserved it by building organizations such as, Perpi Harimurti, Krisnamurti Mataram, Popsi Bayu Manunggalm etc. 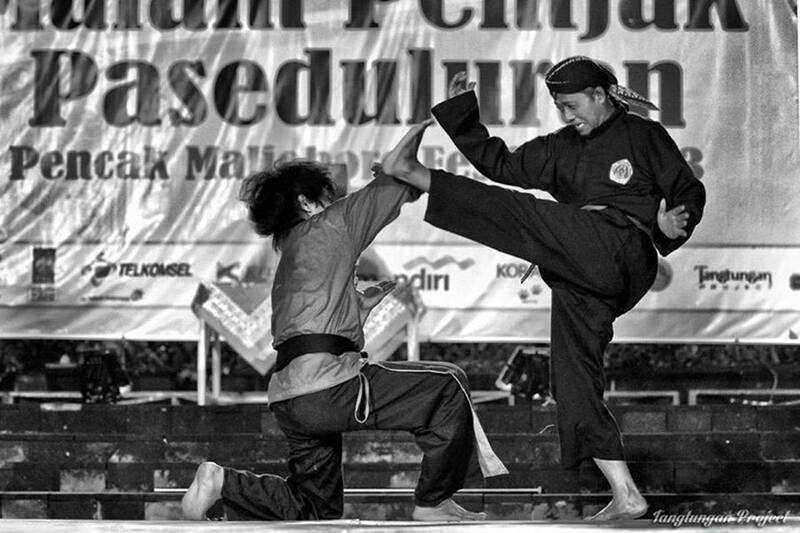 These are organizations which inherited and continue to preserve the Pencak Silat Style made by RM Harimurti. Other than a martial artist, RM Harimurti was also known as a master of the art of dancing during his lifetime. His dancing skills are notorious to the nobles of Keraton Yogyakarta (the Sultanate). RM Harimurti often participated on dance events and festivals that are held by Keraton taking on the roles of Raden Dursasana or Patih Mamangmurka which many dance masters say he did exceptionally well. Because of that it is quite understandable that the moves of the Pencak Silat that RM Harimurti passed down is also very fluent and contains the element of beauty from the dance moves. Specific to his Martial Arts Skill RM Harimurti acquired this from his hobby of Martial Arts during his youth. RM Harimurti studied and mastered 8 different styles of Martial Arts during that time. After that He became one of the most well known for his prowess in Gerak Pencak as a Martial Art. RM Harimurti is also known as a person as a healer, people come to him for help. He was never married and therefore has no direct descendant. Before passing away RM Harimurti has a big number of students which spread all across Nusantara (now Indonesia). At least 3 of his teaching which are: Seni Gerak (Pencak Silat), Seni Pernapasan (Breathing method) and teachings about life. Seni Pernafasan (breathing mehthod) that RM Harimurti created was once published as a book by Bapak Warsono by interviewing bapak Tarsono, a student of RM Harimurti which inherited the breathing method. Another Inheritor to Pencak Tedjokusuman was Bp. Subarjo (passed away), in his lifetime as an elder and Guru of the Krisnamurti Mataram school, he was one of RM. Harimurti’s most trusted student and was also known as a student which is most capable in terms of mastering the technique and art of gerak pencak gaya Tedjokusuman. He was said to be entrusted on selecting students which will be taught by RM. Harimurti personally. A stance is always standing upright, facing forward and standing perfectly. What a stance means is a posture that is ready to anticipate the opponent’s every move and action. In this posture one must be able to attack, block or any other moves such as feints or positioning to strengthen their position. In this form eyesight must always face the opponent to be able to react to every single change and action from the opponent openly and immidiately. Other than that a stance is also a waiting position, therefore it has to be comfortable to be held for a long time if necessart. Sometimes when needed the stance could be changed to another stance instantly to adapt to the situation. On stance, both feet must tread perfectly, both legs support the body weight equally as if standing normally, enabling body weight and leverage to be transferred from one leg to the other with relative ease. Weight shifting is one of a key aspect of movement when stepping in the process of attacking or defending. To Attack or defend perfectly a strong foothold must be established. Without a strong foothold an attack or a block would be powerless and would not project a strong effect. While stepping to perform an attack or a block, the body position and foot has to be on the right place. Which is why foot movement and steps are important, one of the most important part of a move. In the right position an attack or even a block could be very powerful and deadly. This open palm form requires strong fingers and high awareness, because these open fingers could be easily injured when attacked, which is why the fingers has to always be held together and ready. The fingers has to also be trained to be strong and dexterous. In this open palm form it shows that we are not posing a threat to the opponent but rather welcoming and ready to face whatever actions the opponent uses. During his studies RM Harimurti trains and mastered several different martial arts, hence his mastery of movement is complete. Be it hands or legs they are part of the body that has to be controlled and used to attack or defend. Therefore like arms, the legs must be trained equally and should be able to attack, defend, or even lock, although differently. Leg movements are actually very similar to arm movements that are performed underneath. Therefore all moves be itu attacks or blocks feet are always pointing downwards. Foot movements are recommended to be only as possible (as far as a person could lift his foot normally without exertion) not for performing attacks that are too high. For movements to higher targets it would be easier and much more effective to use the hands. From the studies and experiences of RM Harimurti, especially witnessing and hearing about the history and characteristics of his students, RM Harimurti trains them according to their Physical and Psychological Traits of each and every student. Students that are relatively tall will be trained in a different style with those who are shorter and so on in accordance to their Psychological traits as well. That is the reason some students master the ground fighting, middle fighting, and upper fighting, and this is one of the uniqueness of each style which generates from Aliran Pencak Gaya Tedjokusuman.